Earn enough event points to choose between the Bat Ray and the Razortail. Each hull has its own distinct strengths, so make sure to be on the lookout for where best to use them! 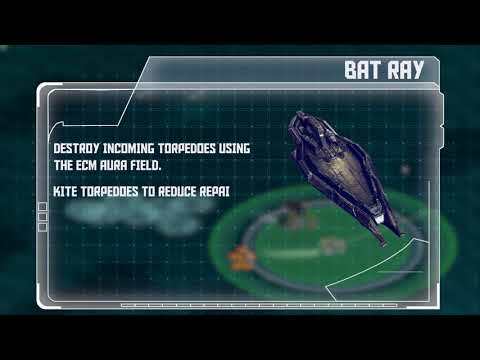 When you choose the Bat Ray or the Razortail, the other ship becomes unavailable to claim in this event. Never fear! The other option will be claimable to you at a later date. This is a crucial Raid for being successful over the next few months, so don’t miss out! This event features a new event store ladder, which allows you to choose between two unlock paths. Choose either the Bat Ray or Razortail blueprint to prepare yourself for the Skirmish Cycle, then that hull’s associated tech will become available to unlock in sequence. The other hull blueprint will be available later this month, but now is the time to get your primary ship ready for action! EVENT OBJECTIVE: Top 20 players in the event leaderboard receive special skins for both the Bat Ray and the Razortail. Note that while you’ll have both skins if you win this prize, the skin for the second ship won’t be visible until claiming that ship’s blueprint in a later activity or event. GSU-7 Ripsaw Gatling Gun - NEW! Lucanidae UAV Turret - NEW! Gargoyle Depth Charge IV - NEW! Axiom Chaingun Turret II - NEW! Edit: We accidentally had the R15 version of the Wavediver Warheads stat block posted in the briefing. It's been corrected.